It has once again been a long while since we formally addressed the residents of our Champaign-Urbana backyard, the same one in which we work a lot, play some, dream a little, sporadically fizzle out when no one is looking, and even live once in a blue moon. In fact, it has been almost a year and a half since we began tying current notions with past attempts at discussing the nuances of what we consider our movie culture du C-U. We have not even drafted a completely original “In My Backyard” since 2012 – the pedagogical drought will finally end next February – although we’ve abstained form retro-writing the missing annual summaries because, hell, you’re more than capable of searching C-U Blogfidential for the names, titles, dates, and stories you’d love to catch up with. Consider this post yet another placeholder that gives us an excuse to revive old and obscure copy from various sources to aid us in fleshing out Confidential history and point us towards a future when things will not be quite the same as you’re used to in this corner of MICRO-FILM Country. Much of the material appears on CUBlog for the first time. With the fifth element in place, we secure the foundation upon which we’ve built our “Backyard” premise, stating that we need to chew over the past a little before moving proactively into a present state where we need to be. Our continuation of the series involves a misguided response from your now-humble editor that appeared as a letter to other editors in buzz magazine, the Daily Illini’s arts and culture weekly, 15 years ago this month in their October 9, 2003, edition. At first glance, it seems to cover similar ground to a local film defense appearing three years earlier in The Octopus by siding with community creators, Jason Butler and Mark Peaslee of WEREWOLF CEMETERY infamy in this case. Ye Ed all but dismissed a feature article written by University of Illinois student Matt Pais on the duo’s then-current monster-piece, the lovably low-rent comedy/sci-fi/musical THORAXX II: THE BREEDING. He felt it deliberately tacky in the way Pais described their projects and working method using a dismissive tone, not exactly helped by the cover illustration teasing it, and the effort rubbed this Local Film Fan the wrong way. In hindsight, I missed the contextual “on ramp” when handing down my criticism. 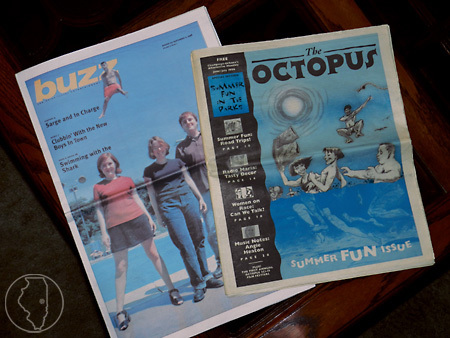 Whereas my Octopus editorial sprung from a legitimate concern – the removal of film classes and gear from UIUC well before digital tools became the norm in coursework – the buzz rebuttal kind of glossed over what Pais had actually done in his feature. It appeared a few years into the MICRO-FILM era when I felt the need to explain the low-budget, shot-on-video-before-it-was-standard-course arena to everyone as a junior investigator as well as a self-appointed herald of their very existence. Coupling this stance with my ongoing annoyance in regards to the paucity of coverage given local films in local media, I could feel a sense of insider superiority at times even though it did not surface often in my own writing. 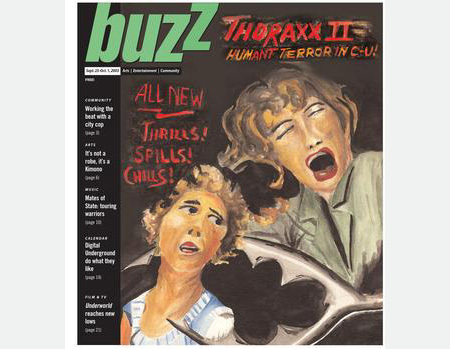 I was intent on making sure Butler, Peaslee, and their beer-reimbursed brethren received a fair shake in buzz’s pages despite the non-classic nature of THORAXX II. Although I attempted to justify my concerns with pragmatic examples from elsewhere in Champaign-Urbana, they really didn’t apply to Pais’ effort. Simply put, the student journalist had a good ol’ time telling the Brainsmart Productions story in a manner that he probably wouldn’t have gotten away with in most of his other film or television reporting in buzz. He latched onto both the Peaslee/Butler wavelength – wry humor, self-depreciation, and complete lack of pretense – as well as the sketchy lo-fi veneer of THORAXX II – an expanded version of a college class project for costar Ann Fitzgerald – and ran with it. The interviews (and movies themselves) provided the amiable ammo. Pais did his job and captured the flavor of something unique happening near campus. 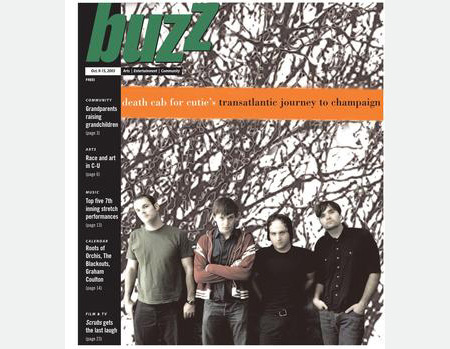 I should have done my job and simply thanked buzz for giving them a cover story. Nobody at the Illini Media Company ever responded directly to me and Pais obviously took it in stride; he eventually built a body of his own media criticism and journalism in Chicago after graduation, so, good for him. We sometimes get things wrong even if we believe ourselves in the right. This particular situation is rather benign when compared to the host of head-spinning issues facing our persons and society today, but we can at least feel empowered in taking our Champaign-Urbana cinema scene seriously enough to make it a point to others. That is a lot truer today than 15 years ago when THE BREEDING infested our dark alleys and dank bars. Now that the lascivious Humant is off our backs, it’s time to read on, MacDuff. p.s. Happy 20th anniversary, buzz! I applaud buzz for taking the time last issue to recognize the movie mirth and mayhem produced by Jason Butler, Mark Peaslee, and their colleagues. With THORAXX II and last year’s THE TEETH OF THE BOTTLE, the man known to many as “JB” has certainly come a long way, baby. However, the accompanying editorial applauding their efforts is mildly degrading and rather ill-informed about film arts and Champaign-Urbana. While the general train of thought encouraging our twin cities to support their artists a lot more than they do is appreciated, please look around you a bit closer for proof that moviemaking does exist, here and now. We have other neighbors taking film activity seriously that deserve our community’s support. These include people like documentary filmmaker Jay Rosenstein, whose new film THE AMASONG CHORUS makes its local debut on Oct. 8 at Beckman Auditorium, and Mike Trippiedi, who has been making low-budget black comedies on this own dime for 20 years, such as DOGS IN QUICKSAND and BUCKY MCSNEAD. The university’s film club, Illini Film & Video, which was founded by engineering students Andrew McAllister and Mike Stone almost four years ago, has collectively produced dozens of films, with Chris Folkens’ production TRIAD setting the bar of public recognition with three capacity-crowd screenings at the Armory in May. Your most glaring omission, of course, is the family drama CRAB ORCHARD, a feature-length production produced [sic] by local filmmaker Robin Peters through his company Dreamscape Cinema. This film is indeed a professional independent film made with professional talent from Los Angeles, professional crew and equipment from Chicago, and most importantly for pride (if not sales potential), local people, area locations, and – get this – central Illinois money. Not that much money, compared to beefy Hollywood productions, but enough to make it happen. Sure, THORAXX II might only accomplish so much with a “measly $1,000.” But, you know what? At least the Brainsmart brethren hunkered down and did what most people in Champaign-Urbana haven’t done – they made a movie. By the same token, Peters might only be able to accomplish so much with his projected $600,000 budget for CRAB ORCHARD, but you know what? He’s doing what most of us wish we could do – produce a movie with name talent (Ed Asner, Judge Reinhold) that has a chance of being completed, distributed, and seen by people the world over, not just in C-U. So, it leads back to the question – can Champaign-Urbana support its filmmaking artists, let alone the artists of all stripes who learn, teach, and attempt to ply their trade here? Does it have to be a foregone conclusion – or rather, a cynical myth spoken by many without much thought behind it – that creative people have to leave this place sooner or later in order for them to be creative and financially sound? It’s your call as well as mine. buzz magazine, Vol. 1, No. 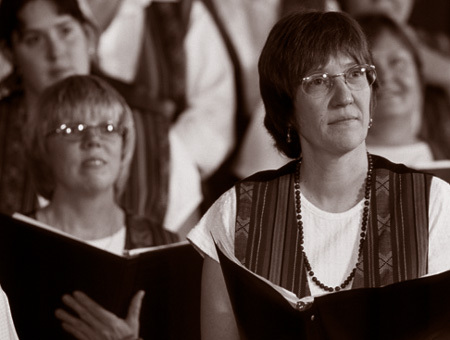 31, October 9-15, 2003, p.2. Article © buzz/Illini Media Company. *This should have run in 2017. We know, we know. This entry was posted on Monday, October 22nd, 2018 at 7:00 am	and is filed under Alums Done Good, C-U Blogfidential, JP Confidential, Media Coverage, Print Matter du C-U. You can follow any responses to this entry through the RSS 2.0 feed. Both comments and pings are currently closed.